Hoofprints in the Sand is a great read for horse lovers – and those who don’t think of themselves as horse lovers will still find plenty to intrigue and fascinate. It’s clearly based on a lot of hard research but the result is very readable. 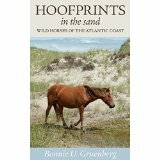 Hoofprints in the Sand was the first ever book to compare and contrast the USA East Coast herds of feral horses and ponies – but it is so much more. For example, did you perhaps read the book Misty of Chincoteague or see the film “Misty” about the wild ponies of Assateague, an island off the coast of Virginia, USA? If so you’ll remember the famous annual round-up and swimming of the horses across to the mainland. Hoofprints in the Sand has plenty of facts about these ponies and those on other “barrier” islands, together with explanations of their likely heritage and why horses and ponies were bred on islands. You’ll also find out too how wild horses behave – and why. • Grass contains silica (basically sand) – and so wears horses’ teeth. The book authoritatively corrects a number of misapprehensions about mustangs, their origins and behavior. There are some accounts of key horse-breeders over the centuries and about specific horses and herds. Finally, there’s a chapter on where you can actually visit to see the East Coast horses discussed in the book, there are some useful tips for campers on how to avoid inadvertently endangering these beautiful horses and ponies – oh yes, and there’s a bibliography in case you’d like to read more. Rosewater: directed by the Daily Show’s John Stewart. A film about a journalist incarcerated and interrogated in Iran with the very, very watchable Gael Garcia Bernal and the Danish guy from The Bridge. I really, really recommend this film. Excellent. Grim subject but very uplifting turnaround. The Keeping Room: an American civil war film (The Keeping Room) with three amazingly brave, strong women (has a few horses in it) . The good guys (weren’t we taught that the war was about ending slavery) were definitely not good guys in this as they burn the South and attack the women. Still, it is a film. Stereo – A German thriller. This was too violent for me and I wasn’t too keen on the hallucination and psych babble elements. Still it carries you on. I can quite whenever I want: a very funny Italian spoof on Breaking Bad it had a pretty good go at all 5 series in under 2 hours. All in the context of what the financial crisis has done for graduate unemployment in Italy. The nightclub scenes are especially funny. Jauja: set in Argentina in the 19th century but starring Viggo Mortensen and actually more in Danish than in Spanish. Spoiler alert: for the first 40 or so minutes, Viggo gets on and off his horse a lot. He drinks water from various pools. His horse drinks water. Now as you may know, I write about horses in films. So I’m a big fan of horses in film (his horse was a nice bay with a hogged mane) but even so, I did wish for a bit more action…. After the film, Viggo himself gave a Q and A session and just happened to mention that the script for this 108 minute film was only 19 pages…..
Writer’s block: Real? Imaginary? Solutions? 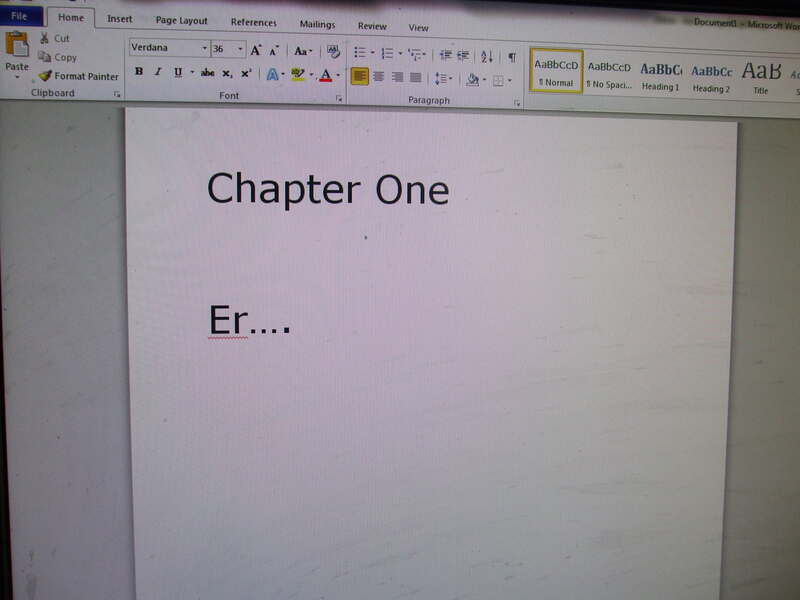 I’ve been a bit distracted from my “proper” writing recently – but have I really got writer’s block? Look up writer’s block and you’ll find it confidently defined along the lines of “writer’s block is a condition, mostly associated with writing as a profession, in which the author somehow loses the ability to write, to produce new work”. Robert McKee (that’s the Robert McKee of the world-famous Story seminar – check out http://mckeestory.com/ ) has suggested that Writer’s block “is not a paralysis of creativity but a malnutrition of material.” The implication then is that if you think you’ve got writer’s block, either you simply haven’t done enough research – or you should just pull yourself together and get on with it. On the other hand, some very famous authors claimed they genuinely struggled with writer’s block. F. Scott Fitzgerald (Great Gatsby etc) is one example. Bestseller Dan Brown has been reported recently as going to the extreme of using gravity boots to hang upside down in order to fend off writer’s block. (ebay’s got some for £17.99 ($27.20) by the way). So is the real answer is somewhere between these extremes? Yes, a lot of it is about research and even more is probably about getting going – just pour it out, write and write. You can improve it, edit out the bad stuff and so on later. That does suppose your starting point is at the least an idea or two and some characters. If you haven’t got those, then maybe try research – even if it’s only walking round the location of your story or dredging your own memory for that spark of an idea, a “what if” line. I think there’s a less obvious, more insidious cause of writer’s block too – the internet and all its associated social media, whether coming at you by phone or by laptop. Yes we can always do some research on the internet – but let’s be honest with ourselves. If we’re not focusing in on some essential detail, say, what type of gun our antagonist might have used and whether that model had a safety catch, chances are what we’re really doing is wasting valuable writing time. “Make a tall stack of tax demands, tuition bills, and mortgage statements. Stare at it until the block disappears. Usually takes three or four seconds.“ (You can substitute your own bills of course – vet bills for injured dog and petrol would be on my list). My brief pause in blogging here has been due to two-week holiday in Costa Rica. (Note to self: I really should crack the art of setting up blogs and tweets for release while I’m away). I had a fabulous time in the rainforest – huge sloths (with long green hair) hanging from the trees, howler monkeys leaping on the roof every night (cute – but believe me the novelty wears off when you’re tired), brightly coloured frogs (poisonous, can be deadly, but hallucinogenic, I’m told – if you get the dose right though you’d need to be pretty foolhardy to try). Above all there were exotic birds. We even glimpsed the famed and rare Quetzal bird. Whenever I go to another country, I’m always interested in the horses and how they are treated. I’ll never forget the shock of seeing underfed and badly treated horses and donkeys in Greece when I went there many years ago on a school trip. Happily the treatment of horses in most European countries has improved enormously (if only because their owners realised bad treatment upset the tourists and might jeopardise the income from them). Developing countries are another matter though. Poverty and sheer ignorance sometimes lead to overwork and poor nutrition for horses, donkeys and mules, whether they pull farm equipment, carry loads or pull fancy pony traps for round-the-town tourist rides. I was very impressed with Costa Rica overall. They’ve been democratic for ages, abolished their army in 1948 and have an admirable programme of green and sustainable tourism and rainforest management. They do not seem to have many horses (probably just as well since they do have venomous snakes. 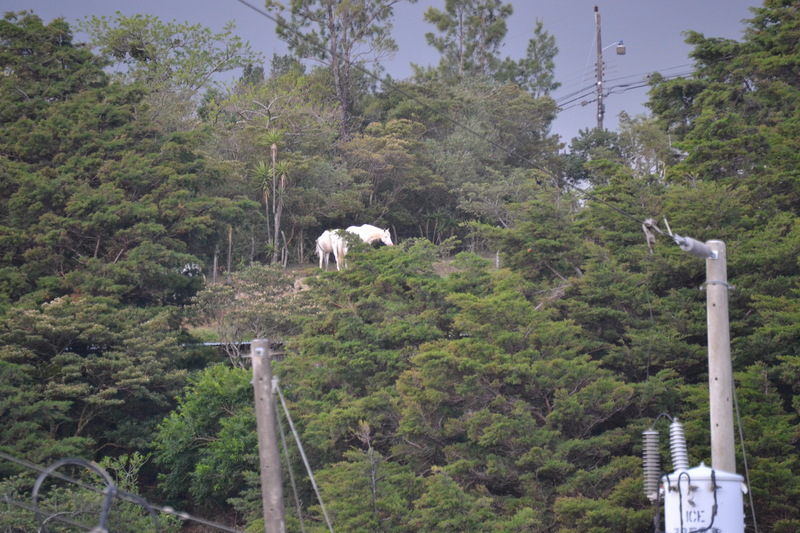 I experienced one magical moment on an expedition in the depths of the rainforest though – suddenly, as I looked uphill, to my amazement I saw two beautiful white horses jumping over a fence. They’d stopped by the time we got the camera focused – but here they are. Interestingly, the museum in the capital San Jose showed that there were horses back in the days of mammoths. I hadn’t realised there had been horses on the American continent before the Spanish conquistadors arrived but apparently there were (until they were hunted to extinction). 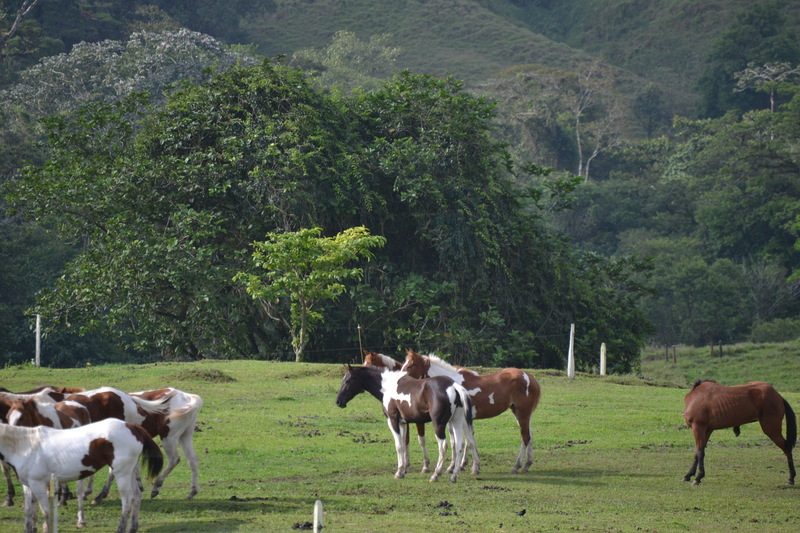 Here to o is a picture of some Costa Rican riding trail horses. You’ll see they don’t look neglected.